Keep your laptop and papers dry in Crest Design's stylishly casual water-repellent backpack. Made of lightweight Oxford fabrics and high-quality hardware, this backpack is designed to be both comfortable and durable. Padded adjustable shoulder straps and a reinforced top handle allow for easy carrying. The main zippered compartment can fit laptops up to 14". The front zippered compartment is organized for stashing your phone and other essentials. Store your water bottle and umbrella in the two side pockets, and you are ready to step out with confidence, no matter the weather! 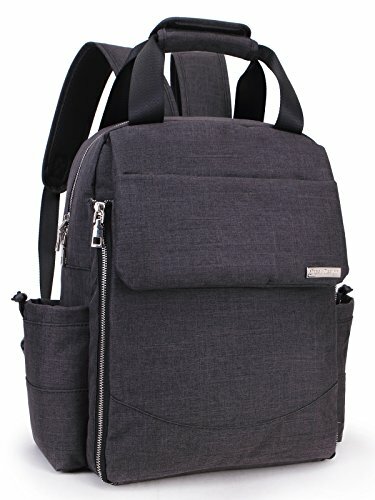 Crest Design is a US-based company dedicated to creating a wide range of unique, stylish, and affordable bags, including laptop totes, casual backpacks, day packs, travel bags, outdoor bags, school backpacks, and accessories to satisfy every customer's need. We constantly seek to exceed expectations, provide outstanding customer service, and deliver high quality products. Water Repellent & Sturdy: Constructed with lightweight water-repellent, tear-resistant Oxford fabric and high-quality durable hardware. Multi-Compartment: Three main compartments, three inside slip pockets and one mesh pocket, two side pockets,provides a separated space for your Laptop,textbooks, magazines, phone, tablet, pen, keys, wallet, books, clothes, bottle and more. Easy find what you want. Dimensions: 11.8" W x 15" H x 6.7" D. Adjustable, padded shoulder straps and top handle for a comfortable fit. The bottom is reinforced for durability. Separated thick computer laptop compartment and Velcro fixed design help to protect your computer better. Multipurpose: Shoulder straps can be hidden in back pocket to convert this backpack as handbag or duffel bag whenever you need. A luggage strap can attach this backpack to the rolling luggage securely for easy travel. If you have any questions about this product by Crest Design, contact us by completing and submitting the form below. If you are looking for a specif part number, please include it with your message.